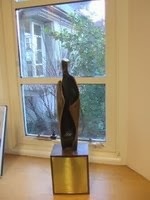 The Peter Dix Memorial Prize for Poetry (the trophy is displayed above) has been awarded to Tania Stokes, with a Commendation going to Caoimhe Cleary. Mr Canning comments: "'Death of a Moth' is delicately atmospheric and loaded with subtle colouring, movement and sound. The evocative language and imagery masks the undercurrent of a desperate struggle for life in a spiritual place. 'Signs of Life' is again full of sounds at every level with the poem linked effectively and simply by two isolated sprung lines. Both her pieces show that Tania is mature beyond her years, a precocious talent." These poems will be published in the coming days. First, 'Death of a Moth' by Tania Stokes. Of a pair of fluttering wings. On a faded red floor. The moth’s instincts were a sorry guide. While it chased the light. Of an emptiness filling the room.